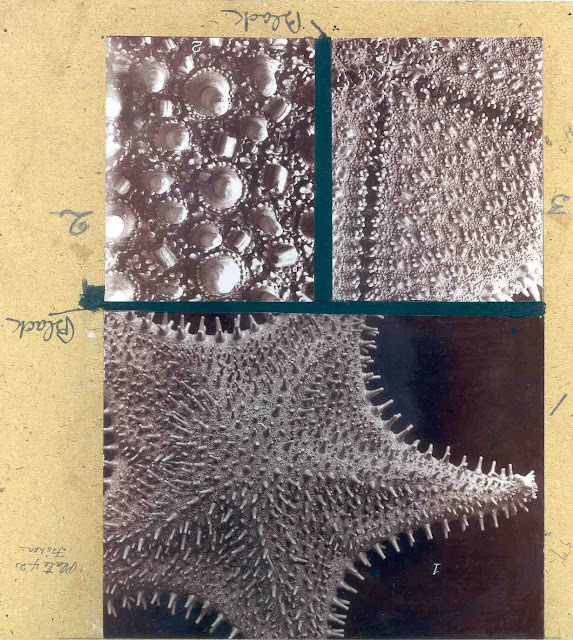 So, because of a lot of moving around and reshuffling of stuff at work, I was reintroduced to some old photographic plates of echinoderms from taxonomic monographs published by Smithsonian scientists from the early 20th Century. But as recently as 10 years ago, pictures in scientific monographs were done by physically mounting photographs onto heavy cardboard plates. Usually, these plates are thrown away after publication, but sometimes they get saved and one gets a real feel of just how different times were before Photoshop and the Internet. Here are a bunch of those plates, complete with instructions, possibly from the original author Walter K. Fisher himself! The weird Trophodiscus sea star with brooding babies! I featured this animal here. This plate was featured in this publication by Walter K. Fisher. These two plates were from the famous Walter K. Fisher North Pacific Starfishes monograph which I featured here. The striking gorgonocephalid ophiuroid Astrocaneum (originally designated here as Astrocynodus) herrerai described by Austin H. Clark in 1918. There's a certain beauty and solid beauty in these original prints that doesn't come from digital images...Plus knowing that that you were looking at EXACTLY the SAME material that the echinoderm greats like Austin Clark or Walter K. Fisher just makes for a damn exciting day! The Mystery of Sphaeraster! 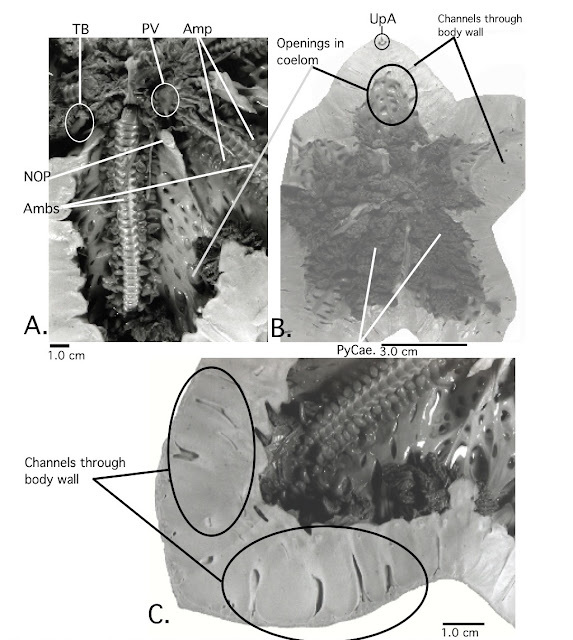 aka JURASSIC fossil starfish are WEIRD! Today, an AWESOME treat courtesy of Christan Neumann, a German paleontologist who runs the Tornadoropa website. 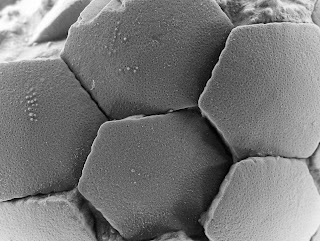 Christian studies fossil echinoderms, especially sea urchins and sea stars and put me onto a new short paper he's written in Arbeitskreis Palaontologie Hannover 37: 92-97! Most of the pics featured today are courtesy of his article! But...WHAT? 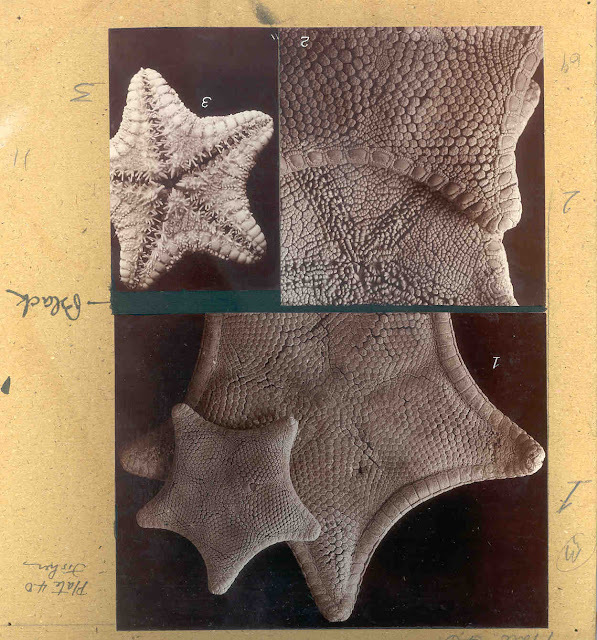 You didn't realize that there was such a thing as starfish FOSSILS? 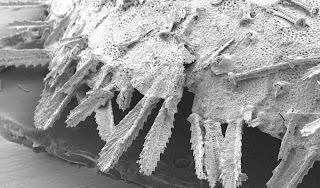 Starfish, like other echinoderms are composed of thousands (maybe even hundreds of thousands) of individual calcium carbonate pieces (called ossicles or plates)! So, when they die, those pieces often get scattered into the sediment or the water or etc. That is why starfish ossicles are SO rare. 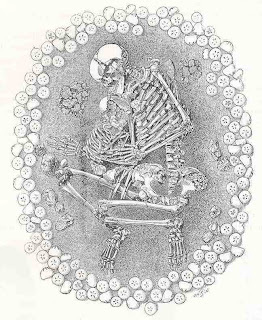 When they die, these pieces scatter very easily and they fail to preserve over time. BUT, sometimes we get lucky! Those pieces get preferentially preserved, sometimes while they are still connected together, articulated into large chunks or EVEN the complete animal! 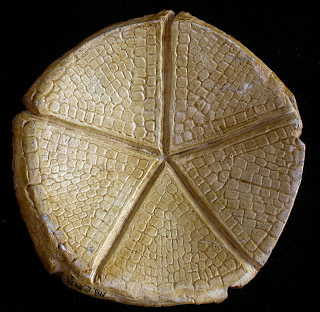 So, in this case, we have pieces that clue us in to one of the most enigmatic of fossil echinoderms! The Sphaerasteridae! 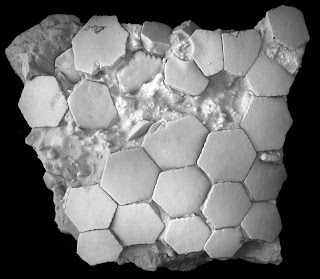 An engimatic group of asteroids from the Jurassic! While dinosaurs were trying to figure out how to roam the Earth, these guys were happily sitting around in the seas of the Mesozoic! You often recover MANY different pieces. Here we have fragments of Sphaeraster punctatus.More precisely..you get either individual pieces (i.e., individual plates) or a "chunk" of the animal that looks like this. Eventually, you have enough different fragments, pieces, and etc that you can make a guess as to what the original animal looked like. 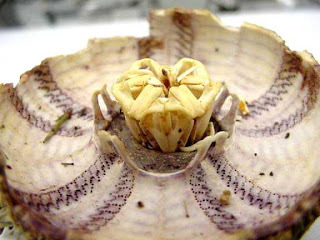 Starfish paleontology is a LOT like dinosaur paleontology or assembling an airplane model kit without the instructions! You've got a bunch of pieces and you have to reassemble them into what looks like the right shape! So..what you've get here..VOILA!! A reconstruction of Sphaeraster punctatus (described by Schondorf in 1906!). It was weird but not really that big..about 75 mm across from left to right. Now bear in mind this is a RECONSTRUCTON. The fossils aren't nearly as nice as this. 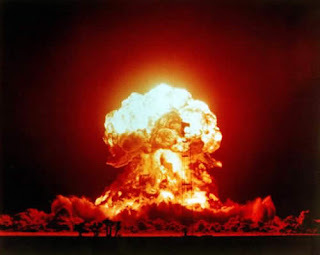 But it gives you SOME idea of what it looked like. 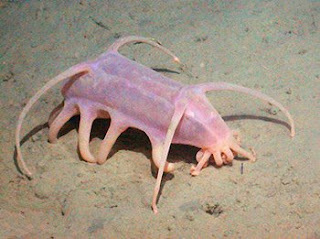 So, what did this odd-looking thing do when it was alive?? One of the most useful ideas for interpreting these fossils and putting them back together is a concept in paleonotology-indeed ALL of Geology-called Uniformitarianism! Basically, this is the idea is that a lot of the physical processes and relationships that happened in Earth's past are generally the SAME as they are today. So, we look for critters that appear SIMILAR today... Because its possible the same physical forces may have influenced their appearance and body shape (and giving us insight into Sphaeraster!). 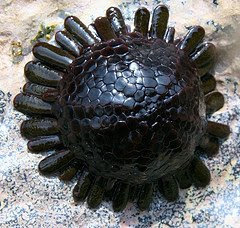 For example: The Shingle Sea Urchin Colobocentrotus! 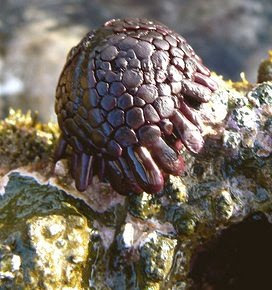 Colobocentrotus makes its living by using its flattened spines to deflect waves in its habitat: the harsh intertidal zone in the Indo-Pacific. Interesting. Its got the plates. Its got the flange around the edge similar to the plates on the reconstruction. BUT its NOT a starfish. Not directly related-but could it have lived this way??? Possibly. Could it be Xyloplax?? The mysterious asteroid-like beast with a flange of spines around its edge? 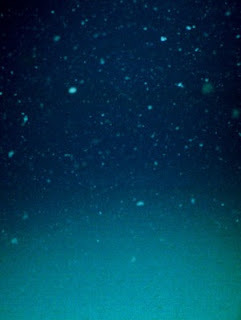 These beasts live in the deep-sea on sunken wood where they live flush on the surface. Again..possibly/probably not related-but could it have lived THIS way?? Or perhaps...the strange "top hat" starfish, Tremaster?? ..or could it be The LIVING completely, SPHAERICAL starfish-Podosphaeraster??? 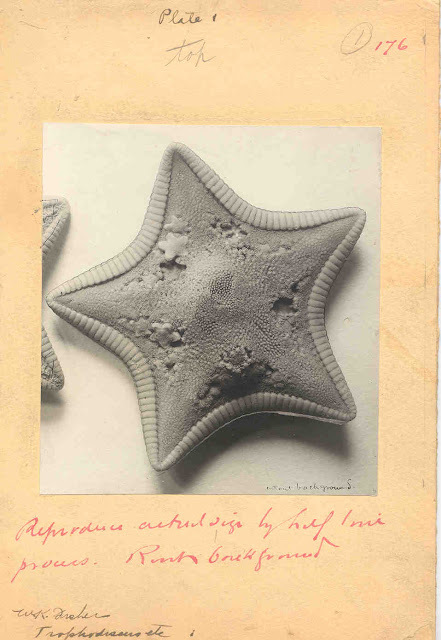 At first, these nearly round sea stars WERE thought to belong to the fossil Sphaerasteridae. 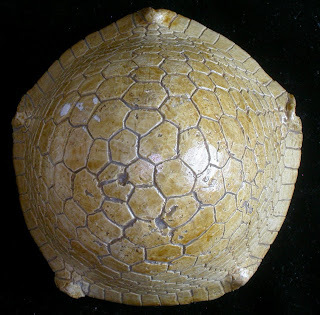 But over the years, these strange creatures have eventually come to be classified in their own unique family-the Podosphaerasteridae and separated from the fossil Sphaerasteridae. and while, this is plausible, it should be noted that NOTHING is known about these critters. So, maybe its not a podospherasterid either..? We have some AMAZING body shapes and morphology but we have very little biology to match it up with! Where does that leave us?? Believe it or not, this is it. This is practically our total state of our knowledge of these animals. These beasts fall into the category "about which, little is known..."
It is a pretty curious place where Paleontology and Deep-sea Taxonomy converge! 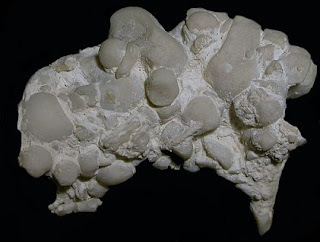 Both involve specimens (often damaged) with unusual shapes or structures which have been subjects of attempted "interpretation". Both often involve bizarre mophologies without any direct observation of ecology or even fundamental life mode. Both subjects usually involve rarely encountered animals which only exceptionally are discovered intact! The moving of my office and etc. 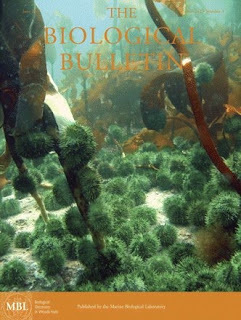 has been a huge time sink..and so, here is another "Best of the Echinoblog" this time around: SEA URCHINS! I will have new good stuff next week! A trick or treat ??? from 2008 Halloween! 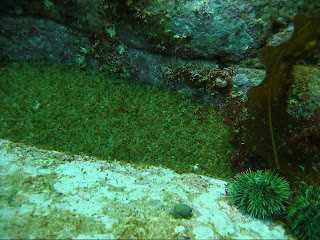 Sea Urchins ARE... perhaps the most heavily studied of echinoderms.. Read a quick survey here... 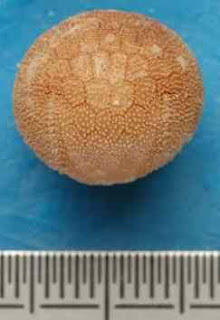 The Tenacious Indo-Pacific Shingle Urchin! Holding on in a Rough World! 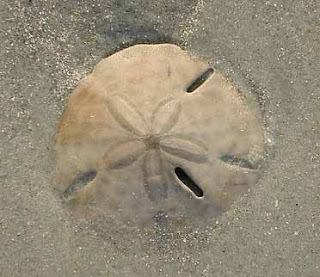 What are the holes in Sand Dollars for?? And What about Weight Belts??? 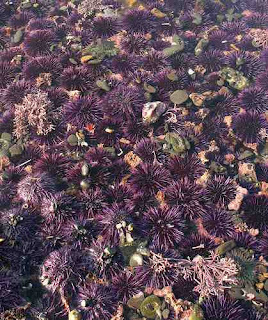 How Long Can Sea Urchins Live?? The answer will surprise you. Is the Jaw REALLY called Aristotle's Lantern?? 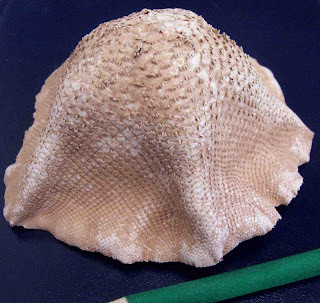 Sea Urchins are also seen in ARCHAEOLOGY!!! Go here. and HERE. 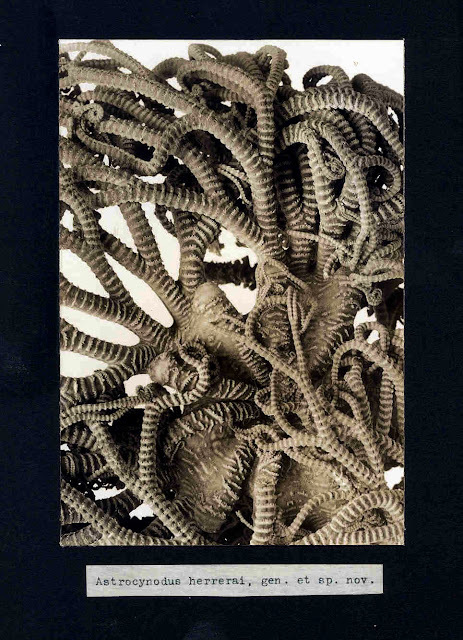 Cidaroid (echinoid) Vs. Crinoid (stalked! ): Sea Urchin ATTACK!! So What Was Chris doing instead of blogging last week? For example...this little guy is Linckia multifora, a small fissiparous ophidiasterid. Widespread throughout the Indo-Pacific area.. 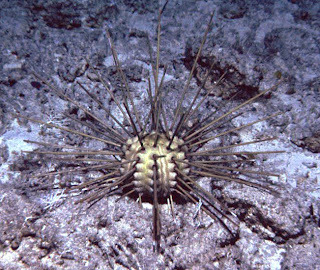 This is another very common member of the Indo-Pacific echinoderm fauna..the sea urchin Echinometra, probably E. mathaei but species for this genus are difficult to tell from pictures..
and finally, what looks like Diadema to me..with species hard to call from a picture.. Nothing terribly dramatic..but I have been relocated to a new office just down the hall!!! With LOTS of papers and stuffs to move!! But the new office is worth it! and thanks to Daniel Brown at Biochemical Soul for providing some of the new decor in my office!! (note that the poster also shows the phylogenetic relationships of the extant taxa!!) Keen! You can buy the poster from Zazzle..here! A GREAT view of the National Museum of American History and the WA monument from my desk! 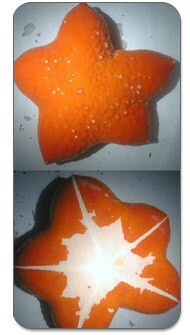 Astrosarkus: Discovering The Great Pumpkin Starfish! FIRST VIDEO of this species ALIVE! This week! 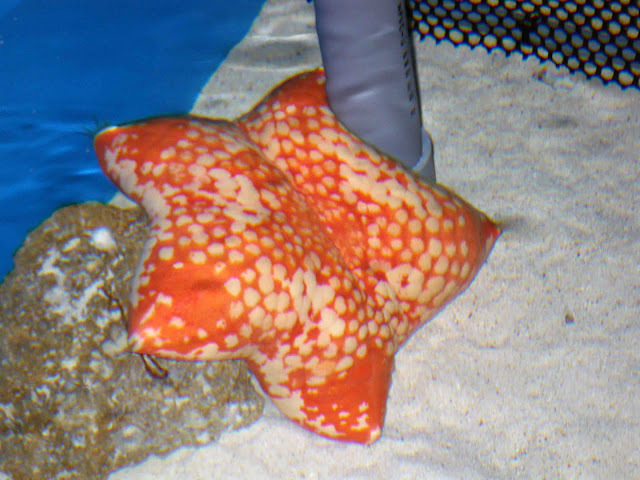 A Fall-October Starfish Treat! 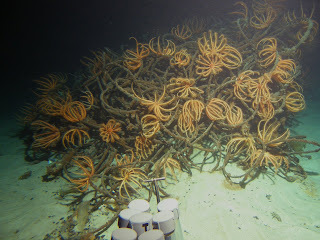 Back in 2003, I described an amazing new genus and species of deep-sea oreasterid starfish in the Bulletin of Marine Sciences called Astrosarkus idipi from the "sub-reef" region (known by some as the "Twilight Zone") in the South Pacific and Indian Oceans in about 67-200 meter depth. It was one of the most physically stunning starfish I had ever seen. 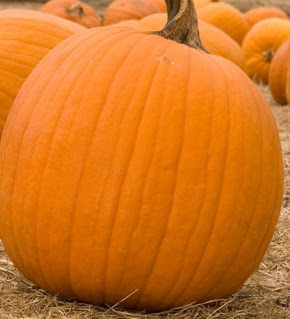 Not only was it the color, but it had the texture, and SIZE of a pumpkin! 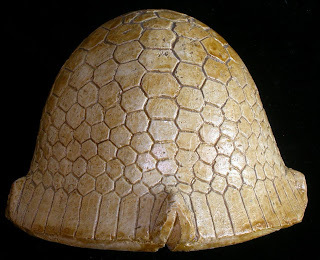 But here was a new GENUS and SPECIES that was easily one foot across (=0.3 meter) and about 4-5 inches (~0.1 m) THICK. It was ENORMOUS. How had such a LARGE starfish evaded description for so long??? Apparently, this particular depth range had been inaccesible to the two conventional types of collection gear-trawl nets and SCUBA gear. The "sub-reef" zone was inaccessible to trawl nets and too deep for conventional SCUBA gear. With the advent of submersibles and deep-diving type "re-breather" gear , scientists could suddenly access a part of the ocean that had previously been poorly understood. 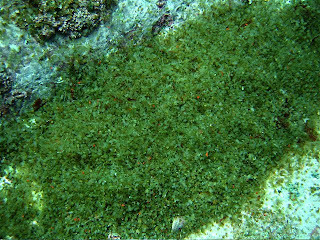 The first specimen was sent to me by Pat and Lori Colin, the biologists at the Coral Reef Research Foundation in Koror Palau, which they had collected their specimen using "re-breather" SCUBA type gear. After that initial specimen I started my PhD and ended up surveying museums all around the world and discovered TWO more of these animals during my travels.. In Hawaii, I discovered the second-known specimen in a 10 gallon bucket that had been in storage since the 1980s. If it were not for the lack of air-conditioning, I would not have been fiddling with the floor fan and discovered the bucket that was sitting underneath it! Oddly enough, this specimen had also been collected in Enewetok by Pat Colin! Years later in Europe, I discovered a second dried specimen from the southern Indian Ocean on a specimen shelf among starfish that had been stored in a marine biology laboratory in Belgium! I began to describe the animal in detail. The specimen actually had to be x-rayed so I could get some idea of what it looked like The animal's skeleton was almost COMPLETELY reduced. Most of the animal was made up of a thick, smooth meat that was criss-crossed with channels that opened into the body cavity and opened out to the body surface. There was almost NOTHING of the externally expressed skeleton that one would normally use to identify it! So, how did I finally determine what it was? Thanks to help from Dan Blake, my PhD advisor at the University of Illinois at Urbana-Champaign, I was able to identify the individual skeletal pieces as unique to the Oreasteridae! The unique type specimen, the HOLOTYPE was ultimately deposited into the Invertebrate Zoology collections at the Smithsonian's National Museum of Natural History. 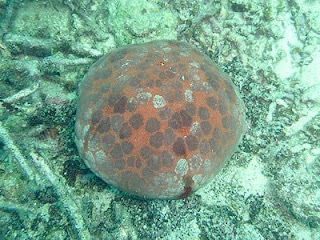 Oreasterids are a group of widespread tropical starfish which have heavily built up skeletons. Familiar members of the Oreasteridae include genera, such as Culctia and Protoreaster, which I have written about in the past. Recently, my colleague, Yoichi Kogure at the Japan Sea National Fisheries Research Institute was able to collect a NEW specimen of this species from Japan! The paper (Kogure et al. 2009. 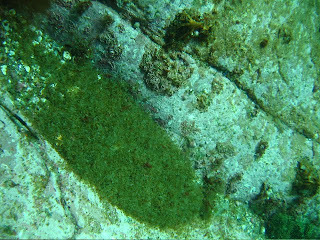 Journal of the Biogeographical Society of Japan 11: 73-76) documents a substantial range extension of this species from Enewetok, Palau, and the southern Indian Ocean to Japan and American Samoa! Amazingly, the Japanese captured FOOTAGE of this animal while it was still alive!! 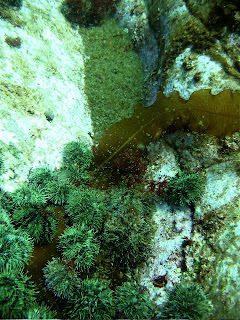 And here courtesy of the ROV cameras of SNK OCEAN CO., LTD. in Japan is the FIRST video of Astrosarkus idipii ALIVE!! The animal remains alive at an aquarium in Okinawa, Japan. Less than SIX specimens exist in museums around the world! Not a commonly encountered animal to be sure! Its often thought that the great undiscovered numbers of new species are likely to be small and cryptic.. Here we have not only a new species, but a new GENUS that is HUGE. And we're STILL learning about it. What does it eat? How does it reproduce? How old is it? Here's some sea urchin videos to tide everyone over for the three day weekend! Happy Columbus Day! 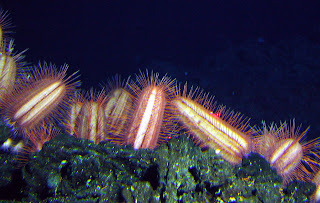 Fire Urchins from the Indo-Pacific!